It still boasts a 12 megapixel Sony sensor, which is coupled with an f/2.8 wide-angle lens. 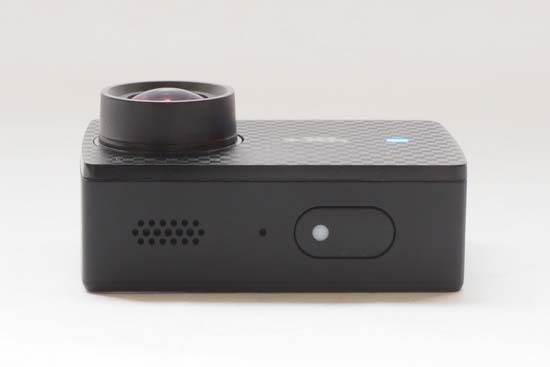 The company still maintains that the camera is the “best action camera ever”, with the new capability to record 4K at 60fps being the main feature to back this claim up. The previous model’s maximum frame rate was 30fps. You can also record at a variety of other resolutions, including Full HD. You can also take stills photos, including the ability to shoot in raw format. Other new features include a USB C connector, the ability to live stream, voice commands and a new processor which promises a 100% improvement on the previous version. 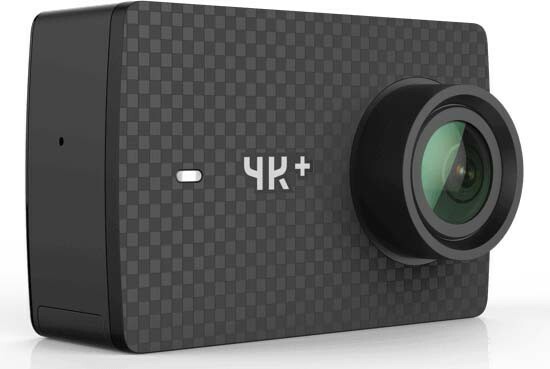 The YI 4K+ Action Camera costs around £300 / $300. 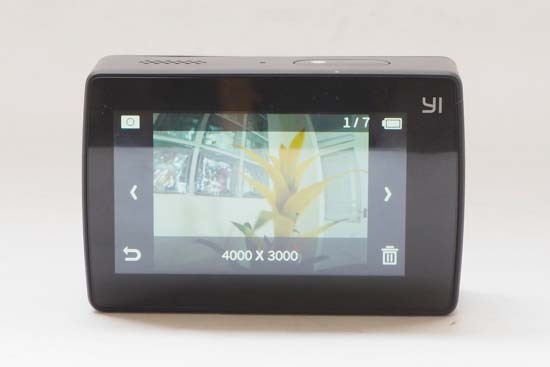 YI has maintained the same compact design for the 4K+ as it used for the original 4K. That means that it is very neat and tidy, being small enough to fit in the palm of your hand. The boxy construction perhaps means it might not fit in a very tight jeans pocket, but otherwise it’s very transportable. The design of the camera is very simple, being rectangular in shape and only featuring one physical button. This is on the top of the camera and is used to switch on/off the camera, as well as start recording or to take a photo. On the side of the YI 4K+ is the USB-C port, which you can use to plug in the charging cable, as well as other accessories, such as external microphone. It is protected by a rubber door, which you release by sliding a fingernail underneath. You’ll find a tripod thread on the bottom of the camera, which is useful for attaching the camera to various gimbals and mounts you might want to use it with. Voice control has been implemented into the YI 4K+, which means there are various commands which you can use (in theory). These are “take photo”, “shoot burst”, “begin recording,” “stop recording”, and “turn off” - which are all pretty much self-explanatory. In order to use them, you simply say “YI Action”, followed by whichever command you wish to use. You can’t use a command to turn the camera back on from off. Sadly, in reality, the camera seemed to ignore the commands in anything but a completely silent environment, while being very close to the camera. If you’re going to be that close to the camera, you could more than likely just use the button in the first place. On the back of the YI 4K+ is a 2.2-inch touch-sensitive screen. It’s a retina display, designed for maximum detail, and is also where you will make all your settings changes. To switch on the camera, hold down the button on the top and wait for it to spring into life. Again, the design on the screen hasn’t changed from the previous 4K model, and as such there’s a good array of information displayed to show you the settings you’ve got selected. You can see how many pictures or video are already stored on the memory card, and how many you have remaining. You can also see the status of the battery, and whether or not Wi-Fi and voice-control is switched on. Along the bottom of the screen are icons which you can touch for different results. To the far left there’s a playback icon, which allows you to view any images or video that you’ve already recorded. On the far right, there’s a cog-shaped icon, which you can press to change the settings of the particular mode you’re working in. In the middle of the screen you can tap to change the photo or video mode you’re in. The different modes available include Photo, Timer, Burst, Video, Time Lapse Video, Slow Motion, Time Lapse Photo, Loop, Video & Photo, Live. You can also achieve the same end result by swiping left and right on the home screen to move between the different modes available. It’s useful, but it’s also possible to accidentally change recording mode if you’re not careful - make sure to check before you start recording / taking photos that you’re actually in the mode you want to be in. A few options will also be revealed if you swipe down from the top of the screen while in the home configuration. You can switch Wi-Fi on/off, voice command on/off, search for a bluetooth remote, lock the screen and turn the camera off altogether. If you have locked the camera, you’ll need to unlock it again before you can use it. Although primarily designed as an action camera, you do have a decent amount of options when it comes to the Photo mode. You can change resolution (up to a maximum of 12 megapixels), shutter speed, metering, white balance, ISO (up to 800 is available), exposure compensation, add a time-stamp, and choose whether or not to shoot in raw format. A second menu page at this point features other options including switching on or off lens distortion, formatting the memory card, screen brightness, volume, and so on. Moving to the standard video mode, and there’s also a fair amount of changes you can make to the settings here. You can set the resolution, file of view, metering mode, white balance and more. Distortion correction isn’t available in video mode, but electronic image stabilisation is - this helps to keep your footage stable when you’re recording while moving. On the bottom of the camera is a door which you need to open to access the battery and memory card. 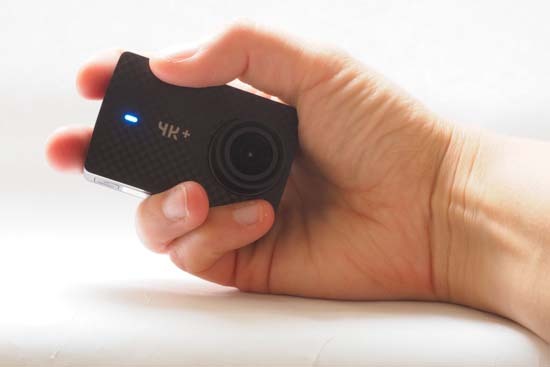 The YI 4K+ uses Micro SD cards. A complaint we had with the previous version of this camera is that the battery door was a little flimsy. That doesn’t seem to be an issue with the review sample we’ve been using for the 4K+, which is good news. 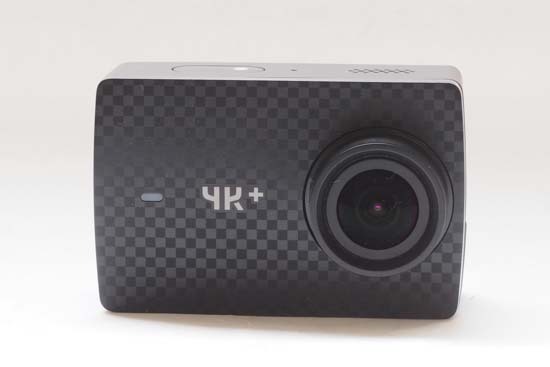 Remember however that the YI 4K+ is not waterproof straight out of the box, but instead you’ll need to use a waterproof housing if you want to use it underwater. The sample we were sent included the waterproof housing in the box, but you can also get third-party housings if you prefer. One important thing to note is that you won’t be able to change settings once the camera is in the housing. This can obviously be a problem if you find you need to change a setting when you’re already underwater. You can get around that issue a little bit by using “housing mode”, which allows you to use the main button to switch between different shooting modes - you still won’t be able to change more in-depth settings, though. If you are interested in using the YI 4K+ with a helmet or handlebars, you might be disappointed to find that such mounts aren’t included in the box. A pair of LED lights are useful for letting you know what the camera is doing. One is found on the front, and one is integrated into the main shutter button. These glow different colours depending on what the camera is doing, such as red when video is being recorded. In terms of operation speeds, most of the time the YI 4K+ is quick and easy to use. However, when you’re shooting stills in raw format, there is a very long shot-to-shot time of around 15 seconds, which can be extremely frustrating if you want to take photos in relatively quick succession. It’s recommended therefore that you turn off raw shooting unless you think you’ll really need it.